Samana Dominican Republic Whale Watching Tour with Kim Beddall. Samana Dominican Republic Whale Watching Trips. Whale Samaná promotes responsible whale watching as a viable economic alternative to “whaling” and a sustainable, non-lethal, use of the North Atlantic Humpback whale. “Our Humpbacks are all born here, that makes them Dominican citizens, they migrate north to feed but always return to their beautiful homeland in the sun.” It is our responsibility to protect this amazing resource, patrimony of the Dominican Republic and the greater Caribbean. Judy Polanco is the voice on the phone and the driving force that keeps our operation running. The most important things in her life are; her faith in God, her family and her commitment to children in need, spearheading programs through her church and social organizations. With the same dedication, Judy has made our office her second home and in her words, “just as whale song brings harmony to the depths of the ocean, managing Whale Samana balances the rest of her life”. Jan arrived in the Dominican Republic over 20 years ago from Manitoba, Canada and fell in love with the country that would become her new home. 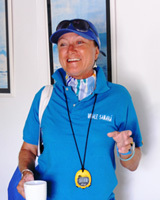 Jan was one of the founders of the first ”Jeep Safari company” on the island and brings with her many years of experience in the tourism industry. Coupled with her love of the ocean and all marine life she has found her niche as the person responsible for our website reservations and the first contact with Whale Samaná for the majority of our whale watchers planning their vacations here in the Dominican Republic. 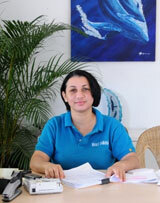 Jan is a wealth of information and her positive attitude and dedication makes her an invaluable member of the Whale Samaná team. 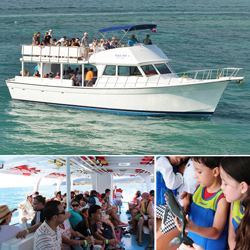 Custom built 55 foot whale watch vessel with two decks and 360 degree visibility for optimum whale observation. Viewing angle of 6 to 12 feet above sea level insures that passengers are watching whales and not waves. Carries 60 passengers comfortably, with room to move around, providing both sunny and shady areas onboard. Snack bar / service area, educational materials, whale gifts and two bathrooms with running water complete the service. Captain Mariano King, born and raised in Samana, is a direct descendant of American immigrants from Philadelphia that settled here in 1824. 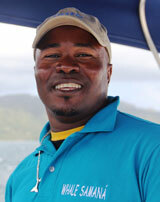 His nickname is “Pimpo” and he has been captaining whale watch vessels since 1992 here in Samana Bay. With 20 years of experience, along with an affinity for and understanding of Humpback whale behavior, that is sometimes astonishing, both our passengers and Samana’s whales are in competent hands, in the whale watch area. 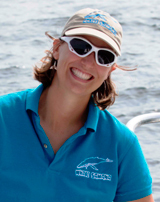 Kim Beddall, animal advocate and conservationist, born and raised in Pickering, Ontario, Canada, has been sharing her passion for marine mammals with whale watchers since 1983. 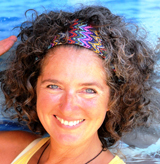 Kim is the founder of commercial whale watching in Samaná, now considered one of the top ten destinations in the world to observe threatened, North Atlantic Humpback whales. Before dedicating herself full time as a cetacean naturalist, Fatima studied Environmental Education, providing her with skills designed to enhance our way of perceiving experiences with nature and techniques to raise environmental awareness. 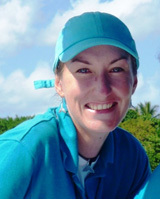 Born in Germany, her ultimate dream has always been to work with whales and dolphins, leading her to the Canary Islands (Pilot whales), the Azores/Portugal (Sperm whales), Madeira/Portugal (Bottlenose, Atlantic Spotted, Bryde's whales), New Zealand (Sperm and Humpback) and Baja California (Grey whales) as an educator and whale watch naturalist. Sharing her knowledge and love for marine mammals is Fatima's way of raising conservation awareness in order to protect cetacean species all over the world. Fatima's work is her passion and her passion is her work, she realizes exactly what a great gift this is. Jane with her joyful personality, love for animals and unhesitating zest for adventure will be back to join us again this winter from Quebec, Canada. 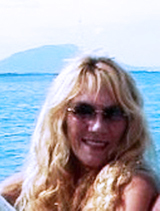 Jane earned her Canadian Coast Guard license as a small craft operator and Eco Tourism guide on the St. Lawrence River in 2011, enabling her to share with hundreds of passengers every summer, the rich diversity of marine mammals in the Saguenay Reserve near Tadussac, Quebec. Jane was recently certified as a NAUI Basic diver in her quest to discover and learn about marine habitat and conservation. This will be Jane's third season with Whale Samana and she is on board to share with our whale watchers her feeding ground experiences and fascination with Humpback whales, all delivered with endless enthusiasm and a brilliant smile. Eva Reznickova , born in the Czech Republic , picked up a camera for the first time in January 2012 and her natural talent for photography soared as she delighted us daily with the images she captured of Humpback whales here in Samana Bay. Eva has added over 300 tail flukes to the CEBSE data base and we are all looking forward to having her on board as our photographer this winter. Eva is an avid outdoorsman and a tireless defender of animals, volunteering for spay neuter operatives and adopting an abandoned puppy here in Samana, who now shares her life in Prague, along with her boyfriend David. Eva’s smile, sense of humor and zest for adventure make her a popular addition to our team in 2015. Olmedo de la Rosa (bottom), at your service on the lower deck. Born and raised in Samana this will be Olmedo’s 20th winter on the water with Humpback whales and whale watchers from all over the world. Olmedo’s #1 concern is your comfort and safety, with a smile, a pat on the back and a willingness to help under any circumstance. Michel Guillandeau (top), at your service on the upper deck. Born and raised in Samana Michel has spent his last five winters running up and down the stairs to the top deck , serving drinks, carrying bags and assisting passengers with whatever they need at the moment. Michel’s duties also include group photos and assisting the captain. Bernard Amstein, Pierre Gallego, Jane Stairs and Jane Stairs.